Get an up-close look at Henry VIII’s royal lifestyle with this priority entrance pass to Hampton Court Palace. Enjoy faster access inside the venue and tours led by costumed guides. View the King's and Queen's State Apartments, Tutor-style kitchens, Hampton Court’s famous garden maze, and more. Discover the lavish spaces where the notorious Henry VIII once resided, indulged and – occasionally – terrorized his court, particularly his six unfortunate wives. 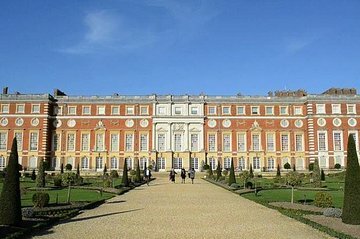 Make your own way to Hampton Court Palace (approximately 35 minutes by train from London) and avoid regular wait times with priority entrance. Once inside, explore independently or join a guided tour to learn about the extravagant palace that evolved from humble beginnings as a grange in the 13th century. Acquired by capricious King Henry in the 1520s, the estate grew in size and grandeur, replete with fine tapetries, furnishings and art. 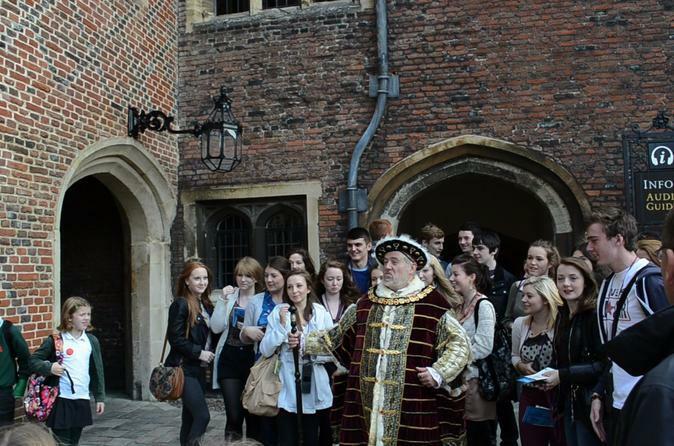 Along the tour, see the Great Hall, the State Apartments, and the enormous royal kitchens. Built to feed the indulgent king and his court of 600 people twice daily, these kitchens were the largest of Tutor England. Families may enjoy the Family Trails tour, a kid-focused palace walk, and a visit to Hampton’s Family Room, a designated space for children to rest and play. After your tour through the magnificent palace interior, head outside to the surrounding gardens. Wander through the unique Privy Gardens, the Great Vine and the Hampton Court Maze – touted as the most famous maze in the world. Fortunately, with no tangental paths to stump you, you won’t get lost within it! Consider the flexible and convenient Royal Palaces Pass. Valid for two years from purchase, this pass offers skip-the-line access to the Tower of London, Hampton Court and Kensington Palace. Explore some of England’s grandest landmarks at your leisure! Palace Gardens:There are over 60 acres of gardens to explore at Hampton Court including the Maze, the Great Vine and the recently restored Privy Garden. The buildings of Hampton Court Palace cover 6 acres and there are many courtyards and cloisters to explore. Henry VIII was Hampton Court's first royal owner, and his magnificent public rooms still survive today. If you can stand the heat, come into the new Tudor kitchens! Real smells, sounds and huge roasting fires will give you a taste of Tudor life. King William III's Apartments are some of the finest and most important Baroque state apartments in the world. These rooms took 30 years to complete and represent a wide range of styles. Some of the most spectacular interiors in the palace can be found here. Every day there are free tours and presentations by costumed guides in the State Apartments. Learn about life at court and the colorful characters who lived here. Hampton Court is one of my favorite spots to visit just outside London. It is well worth the day to enjoy stepping back in time. The exhibits are well done and they are constantly updating and adding to this attraction. Loved Hampton Court Palace. We took ourselves there on the train and didnt really need a priority ticket as there were almost no people when arrived. We purchased the entry tickets before hand but found it really didn't make a difference even if we had purchased the tickets on-site. The audio guide was good but make sure you block several hours to see everything. We didn't get to see everything and we got there at 1230 and thought we had enough time. The attraction is worth the visit, lots of history to see. get this tour to avoid long queues. I loved this tour! It was better than expected. Of course I love history, period. My favorite part was the skit by the actors in the great hall and the kitchens! Just amazing to walk where Henry VIII walked. Since it was cold, we missed a lot of the outdoors areas, but will definitely come back. Amazing. I can't recommend this enough. Absolutely would go back if I get the chance.